Secretary of Labor Tom Perez and President Obama should be applauded for the steps they have taken to restore and strengthen the Fair Labor Standards Act’s overtime protections. The federal government should be using every tool at its disposal to help lift the wages of America’s middle class and working class. Raising the salary threshold used to determine overtime eligibility is an action entirely within the administration’s authority, one that can both lift wages and free up time for overworked middle-class Americans. The erosion of overtime rights over the last 40 years is emblematic of the erosion of the living standards of America’s middle class over the same time period. Since the late 1970s the economy has grown and top 1% incomes have soared, but the share of national income going to the middle class has fallen steadily. 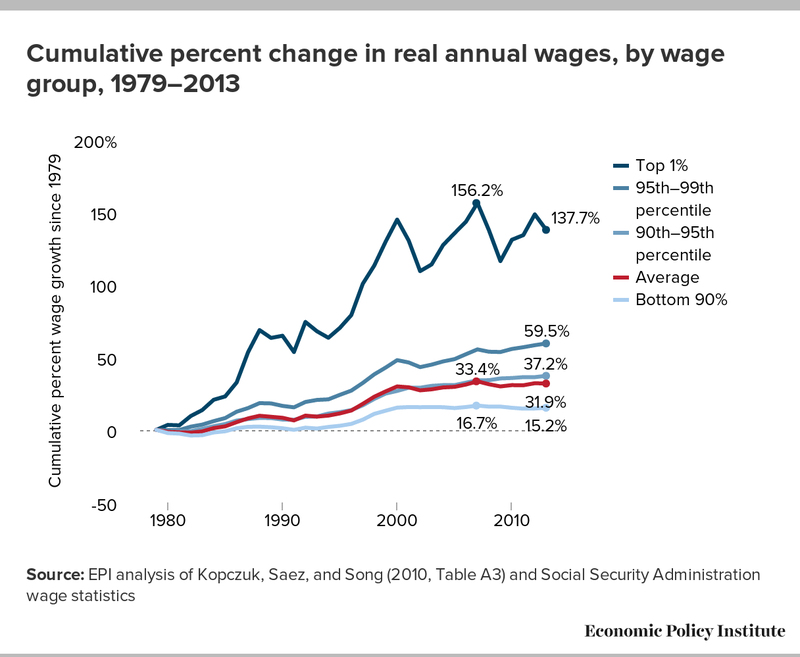 While middle-class wages have stagnated, the top 1 percent of earners had cumulative gains in annual wages of 138 percent between 1979 and 2013, as the figure below shows. This is far beyond any increases in productivity. Since 1975, when the Labor Department last significantly raised the salary threshold that is used to determine overtime eligibility, the threshold has fallen in real terms from $1,000 per week to $455. The share of the salaried workforce that earn less than the threshold—and are therefore guaranteed overtime protection on the basis of their salary alone, regardless of their job duties—has fallen from more than 50 percent to less than 10 percent. In 1979, almost 12 million salaried workers earned less than the threshold and were therefore automatically protected; today, with a 50 percent bigger workforce, only 3.5 million are automatically protected. The department’s decades-long failure to raise the threshold for the exemption of executive, administrative, and professional employees was particularly blameworthy because the pay of executives over that time increased astronomically: CEO compensation has increased 1,000 percent since 1978, while a typical worker’s pay has increased only 11 percent. From 1979 to 2014, the salaries of professionals and employees with advanced degrees increased 27.5 percent more than inflation. To reflect the rising salaries of professionals, the salary threshold should be about $1,270 per week or $66,000 a year. The loss of overtime protection for so many workers is just one of many changes in the rules governing our economy that have helped the elite and powerful at the expense of average working people. What those workers lost was not just the right to be paid time-and-a-half for their overtime, they lost the right to be paid for it at all. Workers who are exempt do not have to be paid a dime for the extra hours they work, whether it’s two hours or 20. In fact, they don’t even have to be paid the minimum wage, and some so-called managers have found themselves working so many hours that their effective hourly rate actually falls below the minimum wage. The Fair Labor Standards Act (FLSA) sets out the rules that govern overtime pay for most American workers. Workers covered by the FLSA overtime provisions must be paid at least “time-and-a-half,” or 1.5 times their regular pay rate, for each hour of work per week beyond 40 hours. Today, retail store managers like Dawn Hughey, who was paid a salary of less than $35,000 a year, are sometimes forced to work as many as 90 hours a week by corporations that profit from their employees’ uncompensated work. A salary and a title are no protection against oppressive overwork, and never have been. The right to a limited workweek provides time for leisure, civic participation, commuting, self-improvement, and tending to family and friends. People who work for a living, and parents especially, know that the business lobbyists are wrong: this isn’t some old, tired bit of New Deal or Great Depression overregulation. The right to a 40-hour workweek or overtime pay is even more important to families today than it was 77 years ago or 50 years ago. Between 1968 and 2008, the share of children living in households in which all parents work full time doubled from 24.6 percent to 48.3 percent (Bernstein and Eisenbrey 2014). Parents have a hard time balancing work, commuting, getting kids to and from school, supervising their kids after school, and all of their other obligations. The balancing act is no easier for a bookkeeper earning $35,000 a year than it is for a bookkeeper or a carpenter making the same money who’s paid hourly. The law does not protect everyone. It provides to employers an exclusion or exemption from the duty to pay time-and-a-half for overtime with respect to bona fide executives, administrators, and professionals, or in the exact terms of section 13(a)(1) of the FLSA, to “any employee employed in a bona fide executive, administrative, or professional capacity.” The law leaves it to the Secretary of Labor to “define and delimit” those terms “from time to time,” and the department’s July 6 Notice of Proposed Rulemaking (NPRM) is a long overdue effort to carry out that responsibility. The fundamental idea behind overtime coverage is to maintain a basic norm about how long employees should work for their employer each week. Under certain market conditions, for example when unemployment is high or workers hold especially low levels of bargaining power, employers could require employees to labor long hours without receiving additional compensation. This was, in fact, the case prior to the passage of the FLSA. Congress decided that this was a market failure based on the asymmetrical bargaining positions of affected workers and employers, and thus enacted the OT rules to discourage employers from subjecting employees to excessive work hours. Rather than banning overwork, Congress chose to make it more expensive, requiring time and a half pay for every overtime hour worked. But who should be covered by such protections? President Franklin D. Roosevelt and key members of Congress began with an assumption that every worker falling within Congress’s power to regulate interstate commerce should eventually have a workweek of 40 hours, with the exception of agricultural workers. But from the first draft of the bill that became the FLSA, the legislation exempted executives as a class that did not need protection, followed in subsequent drafts by administrative employees. They were, after all, the bosses, managers, and administrators who set the rules and policies that governed the workplace. The FLSA OT regulations designate hourly workers as entitled to OT in virtually all cases because hourly pay is not characteristic of the high-level employees Congress originally intended to exempt. In the Department of Labor’s first report on the FLSA’s overtime provisions in 1940, Presiding Officer Harold Stein wrote, “The shortest pay period which can properly be understood to be appropriate for a person employed in an executive capacity is obviously a weekly pay period and hourly paid employees should not be entitled to the exemption.” Hourly-wage workers are also subject to having their wages reduced when they are absent from work for short periods, a condition that does not fit with the workplace reality of executives, administrative employees, and professionals. The department recognized that rules were needed to prevent employers who sought to avoid time-and-a-half payments from simply designating every salaried employee as an executive or in another exempt category. Thus, the regulations laid out a set of tests intended to prevent gaming of the rules. Broadly speaking, there are two tests for exemption: a duties test and a salary test. The duties tests changed over time, as I explain below. The salary test, on which the Department of Labor has focused in the current rulemaking, is straightforward and based on the notion that an employee’s salary level is itself an indicator of exempt status, and that workers paid below a threshold salary level should be paid overtime, regardless of their duties. Under the first FLSA regulations issued by the Department of Labor in 1938, the definition of exempt executive and administrative employees included duties tests and a salary test of only $30 a week, $5 less than the industrial codes had required several years earlier. When the Roosevelt administration amended its overtime regulations in 1940 and kept the salary test for executives at $30 per week, it took pains to explain why it had adopted “such a low requirement” (U.S. DOL 1940, 21). According to the DOL report that explained the regulatory changes, the low salary threshold was counterbalanced by the ease of determining the bona fides of executive function based on the fact of supervision and departmental authority, and by the compensating advantages that could be found in the nature of executive employment: the opportunities for promotion, and greater security of tenure. The FLSA’s goal of spreading employment was not especially well served by providing overtime protection to bona fide executives because, by its very nature, “the executive’s work cannot be shared,” the report said. And crucially, there was less need for a high salary threshold for executives because, by denying the executive exemption to any employee who spent more than 20 percent of his time on nonexempt duties, the amended regulation made it easier to identify bona fide executives. The 1940 regulations also separated the executive and administrative exemptions (which had been merged into a single exemption in the original implementing regulations), provided a less stringent duties test for administrative employees (one with no specific limit on time spent in nonexempt duties), and required a much higher salary level to satisfy the administrative exemption—$200 per month, the equivalent of about $40,000 a year today. The report stated, “It is believed that the employees in the administrative group are so heterogeneous in function that it would present a disproportionately weighty problem in administration to determine what constitutes nonexempt work. However, when this valuable guard against abuse [a strong duties test] is removed, it becomes all the more important to establish a salary requirement for the exemption of administrative employees, and to set the figure therein high enough to prevent abuse” (U.S. DOL 1940, 26). The new threshold of $200 a month was both 1.67 times higher than the $30 per week executive salary test and about 3.1 times the minimum wage. The department further explained its choice of a $50-per-week salary level by examining the pay of a group of office employees whose duties consisted overwhelmingly of routine clerical work (stenographers, typists, and secretaries) and who therefore clearly fell outside of the exemption. The correct salary threshold level would act as a proxy for a more detailed duties test, disqualifying nonexecutive employees by disqualifying employees with lower pay. Because less than 1 percent of the nonexempt employees examined earned more than $2,400 a year, the department determined that the $200-per-month requirement was adequate to guard against abuse. A $35-per-week salary requirement could exempt almost 32 percent of bookkeepers and a $40-per-week salary requirement could exempt 20 percent; in contrast, a $50-per-week salary requirement could exempt only 8 percent of bookkeepers, an occupation that was undoubtedly nonexempt. Most interesting, the department determined that a $50-per-week requirement would exclude about 50 percent of accountants and auditors, a group “whose work, while related to that of bookkeepers, requires in general far more training, discretion, and independent judgment.” The Roosevelt Labor Department found it appropriate and desirable to set the salary requirement at a level that would deny the exemption to more than half of accountants and auditors, presumably because their pay would reflect their employers’ understanding of their actual duties and responsibilities. In 1940, the professional exemption’s salary test was set at $200 a month as well, though the “traditional” professions of theology, law, and medicine had no salary test at all. The Department of Labor’s 1940 report determined that $200 was the dividing line between subprofessional and fully professional employees, based largely on the federal government’s pay schedules. The report constituted the first full explanation of the thinking behind the department’s regulatory choices in implementing the FLSA; it likely accurately reflects the understanding and goals of the Roosevelt administration, which proposed the FLSA, including section 13(a)(1), as well as those of Secretary of Labor Frances Perkins, who championed the act. The next major change in the regulations came in 1950, following an extensive set of hearings and another presiding officer’s report and recommendations (U.S. DOL 1949). The 1949 report outlining the regulations recommended a somewhat unfortunate innovation, the “special provisos for high salaried executive, administrative, or professional employees” (U.S. DOL 1949, 22). In essence, the regulations adopted two versions of the duties tests for each exemption category; the two versions became known as the long test (virtually identical to the 1940 regulations) and the short test (a new, simpler version with fewer elements to satisfy, accompanied by a much higher salary level requirement). The new short test of executive duties, for example, dropped requirements that the executive exercise hiring and firing authority over at least two employees and dropped the 20 percent limit on nonexempt duties. The salary level was set at $100 per week, as opposed to $55 for the long test. Thus, an employer willing to pay a high enough salary could meet the requirements for exemption without having to keep meticulous track of the employee’s time to demonstrate that the 20 percent limit had not been surpassed. The 1950 regulations made a major change in the duties test for administrative employees, adding a requirement (similar to the 1940 requirement for the executive exemption) to what would become known as the long test that no more than 20 percent of the exempt administrative employee’s time could be spent on nonexempt duties. As the department’s report explained, “An ‘administrative’ employee whose more important duties do not take up all his time may typically be assigned a routine function, such as keeping one of the ledgers or making up payrolls. While it is entirely reasonable to exempt an employee who performs a small amount of such unrelated clerical or other low-level work, it would be contrary to the purposes of section 7 and 13(a)(1) of the act to extend the exemption to such employees who spend a substantial amount of time in such activities” (U.S. DOL 1949, 59). Nevertheless, despite an emphasis on limiting nonexempt duties to prevent undeserved exemptions, the regulations set up a higher salary threshold in the short test for the executive and administrative exemptions as a trade-off for eliminating the employer’s obligation to enforce and document the time limitation on the exempt employee’s performance of nonexempt duties. The Ford administration updated the salary tests in 1975, choosing not to fully index them to changes in the consumer price index as a concession to concerns of the Council of Economic Advisers about inflation. The 1975 update—the last increase until 2004—set the short-test level at $250 a week, the long-test level for executive and administrative employees at $155 a week, and the long-test level for professional employees at $170 a week. In 1980, the outgoing Carter administration issued a final rule that would have raised the salary-level thresholds substantially, but the rule never took effect and was withdrawn by the Reagan administration. The 1975 salary threshold levels were left untouched by the Reagan, Bush, and Clinton administrations. The passage of 29 years without an adjustment made the salary levels obsolete and irrational: by 2003, a full-time minimum-wage worker paid $5.15 an hour had weekly earnings above the white-collar long-test salary thresholds. When the George W. Bush administration finally amended the white-collar overtime regulations in 2004, it eliminated the long tests and created tests with a uniformly low and wholly inadequate $455-a-week salary test—barely more than the poverty threshold for a family of four. The 2004 rule also created a new, even more abbreviated version of the short tests with an annualized salary level of $100,000. In addition, the 2004 rule made numerous changes to the duties tests for each exemption category. None of these changes to the duties tests strengthened overtime protection for workers, and virtually all of them weakened overtime protection. In my view, these changes have led to more confusion and ambiguity, and, even worse, to the unjustified exemption of salaried workers who, under the spirit of the law, should be covered, including, for example, an ill-defined class of “team leaders,” certain embalmers and mortuary employees, and athletic trainers. Under the current OT rules, salaried workers earning less than $455 per week automatically qualify for the OT wage premium. Prior to 2004, the long-test weekly salary levels were $155 for executive and administrative employees and $170 for professional employees, and the short-test level was $250 for all three categories, where it had stood since 1975. Had the $250 weekly salary level simply kept pace with inflation since 1975, it would be $1,000 today. There is no cogent economic reason not to adjust this salary cap for wage growth or inflation. Certainly, the spirit of the law is vitiated if a covered worker becomes exempt simply because of nominal earnings gains that have no bearing on the actual purchasing power of her paycheck. Today, employees earning between $455 and $1,923 in weekly salaries (or $23,660 and $100,000 in annual pay) are at high risk of being unjustly exempted from coverage. The law requires the application of complicated duties tests that no longer provide accurate answers to the questions they were meant to address, such as: Does the worker control her own schedule, something hourly workers typically do not? Does she manage others? If so, is that a small or a large part of her job? Does she control her workflow? Does she make important and independent decisions? What credentials must she have to perform the work? Making these determinations has always been complicated, but the regulatory changes in 2004 made them more so. One of the most exhaustive analyses of the problems with the duties tests as amended in 2004 is by Fraser, Gallagher, and Coleman (2004). The next section summarizes some of their findings. The 2004 rule creates an illusion of preserving the long test but in reality, it replaces it with the old short test while attaching a too-low version of the long test’s salary level. Fraser and co-authors write, “In fact, however, the Department’s new rule expands the classes of exempt employees by applying, for the vast majority of workers, a rule matching a variant of the old ‘easy’ duties with the new ‘low amount’ salary. And – presto! – the worker finds a walnut shell with no overtime under it, and the employer is now able to qualify many more employees as exempt than the existing regulatory structure ever contemplated” (Fraser, Gallagher, and Coleman 2004, 14). The abandonment of the 50 percent rule has the potential to exempt workers who perform even a tiny amount of exempt duties. The original regulations issued within months of the FLSA’s passage required that to be an exempt executive, an employee could do “no substantial amount of work of the same nature as that performed by nonexempt employees of the employer.” In its enforcement, the Department of Labor’s Wage and Hour Division treated work in excess of 20 percent of an employee’s time to be “substantial” enough to deny the exemption, and employers generally conceded the fairness of that threshold and the need for a sufficiently definite rule. Thus in 1940, when the Roosevelt administration amended the regulations for the first time, it added a fixed limit on nonexempt work of 20 percent. A new, high-compensation proviso added to the regulations by the Truman administration in 1950 introduced a more expansive allowance for nonexempt duties, one that did not have an explicit time limit; however, this permissive treatment applied only to relatively highly paid employees. Over the years, that looser test became conflated with the determination of the employee’s “primary duty,” which was codified as a 50 percent “rule of thumb”: “In the ordinary case it may be taken as a good rule of thumb that primary duty means the major part, or over 50 percent, of the employee’s time.” In other words, while the 20 percent limit on nonexempt duties did not apply under the short test, it was effectively replaced by a rule that half of the exempt employee’s time had to be spent performing an exempt primary duty. The 2004 regulations went even further and abandoned any serious notion of time limitations on nonexempt duties, a change Fraser and co-authors called “a grievous loss.” (Fraser, Gallagher, and Coleman 2004, 14) The new rules defined “primary duty” as the “principal, main, major or most important duty,” thereby essentially eliminating the relatively more objective factor of how the employee actually spends his or her time. Instead of a rule that only exempts an employee if she spends at least half her time performing an exempt activity, the regulations now state that she may be exempted if the duty the employer considers most important is an exempt duty. Under the 2004 rules, office or nonmanual employees whose work is directly related to management policies or general business operations and who exercise any “discretion and independent judgment with respect to matters of significance” can be denied overtime pay. This is now an arbitrary classification that has lost all connection to the original administrative exemption, which required the employee to be responsible for a function of the organization, if not of subordinate employees, and required him to be engaged in the business operations as a staff person rather than as a production or line employee. When the administrative exemption was first conceived as separate from the executive, in 1940, the department’s report stated, “The term ‘administrative’ can . . . be reserved for persons performing a variety of miscellaneous but important functions in business. This latter group is large in modern industrial practice, and includes typically, such persons as personnel managers, credit managers, buyers, supervisors of machine tools, safety directors, claim agents, auditors, wage-rate analysts, tax experts, and many others” (U.S. DOL 1940, 24). The Roosevelt/Perkins DOL could not have envisioned automobile claims adjusters, for example, qualifying for the exemption, although employers routinely classify them as “administrative” for purposes of the OT provisions. As with the executive exemption, the 2004 rules make no reference to the allocation of the exempt administrative worker’s time. For example, an administrative assistant might have the authority to independently decide whether she should refer certain “cold calls” to her supervisor. Though this happens only a few times a week, it could be considered grounds for exemption under the current rules. In contrast, the original administrative exemption contemplated exemption only of workers fully engaged in managing a function—personnel managers, credit managers, supervisors of machine tools—but not of someone only occasionally involved in an important task. The 2004 duties tests permit employers to game the rules and deny overtime to workers who should not be exempt. The “team leader” provision, for example, assumes managerial responsibilities for team leaders on “major projects” and grants exemptions when those responsibilities are deemed sufficiently important to the employer—a completely subjective determination. Likewise, the 2004 duties tests allow exemptions for workers with various credentials or licenses, again with no reference to actual managerial, supervisory, or independent responsibilities. Several important principles emerge from this review of the regulatory history of the so-called white-collar exemptions. Bright-line, objective tests regarding duties are preferable to the ambiguous and ill-defined subjective tests that have replaced them. Explicit limits on the time that exempt employees may spend performing nonexempt duties would provide far more guidance than vague tests based on the employer’s subjective feelings about the importance of one duty compared with another. In the first years after passage of the FLSA, when the law and its purposes were freshest in the minds of the Department of Labor officials who had advocated for and helped draft the act, the regulations reflected an understanding that an exempt employee should do no substantial amount of nonexempt work, and should in no case devote more than 20 percent of her time to such duties. Clarity and simplicity are aids to administration and to compliance by employers. For example, if employees cannot understand whether they exercise sufficient independence or judgment in their work, or make decisions about sufficiently important matters, to be exempt, they cannot demand their rights. The more employees and employers can rely on objective tests, the better. Although it would be reasonable to restore the original requirement that an exempt executive may not perform any significant amount of work of the same nature as that performed by nonexempt employees, and in no case may such work involve more than 20 percent of an exempt employee’s time, the highest priority should be proper adjustment of the salary threshold. In a paper we submitted to the Department of Labor in November 2013, Jared Bernstein of the Center on Budget and Policy Priorities and I recommended that the 1975 salary threshold of $250 per week be adjusted for inflation since that year. The adjusted level is $1,000 per week, somewhat higher than the level of $933 chosen by DOL. We stressed that the salary level has become increasingly important over the years as a bright-line indicator of which employees are clearly exempt and which are not. However difficult it might be to judge whether an employee’s primary duty is truly that of an executive or exempt administrative employee, an employee and her employer can easily determine the level of the employee’s pay. The salary level is the clearest, most easily applied test of exemption. To be commensurate with the status and prestige expected of exempt managers and executives, the salary level should be well above the median wage paid to the typical production, nonsupervisory employee. When the Ford administration raised the weekly salary threshold in 1975, it was 1.57 times the median wage. The median weekly wage today is $802. Were DOL to update by that same ratio—1.57 times the median weekly wage—the short-test threshold would be around $1,259 on a weekly basis and $65,468 on an annual basis, suggesting that DOL’s $933 proposed weekly threshold is well on the low side. On the other hand, the relationship between the original salary-level-test threshold and the minimum wage was 2.73-to-1. When the administrative test was established as a separate category of exemption and given its own salary level, its ratio to the minimum wage was 3.1-to-1. And in 1975, before the 29-year period when the department failed to increase the salary levels, the short-test salary level was set at a ratio of approximately 3-to-1, close to the ratio (3.2-to-1) of DOL’s proposed level to the current minimum wage of $7.25 an hour. The salary level for exemption must also be, according to the Department of Labor’s 1949 report, “considerably higher” than the level of newly hired “college graduates just starting on their working careers.” As the report explained, “[t]hese are the persons taking subprofessional and training positions leading eventually to employment in a bona fide professional or administrative capacity” (U.S. DOL 1949, 19). Entry-level wages and salaries for college graduates in 2013 were $21.89 per hour for men and $18.38 per hour for women. Using the Department of Labor’s reasoning in 1949, the salary level for exemption should be “considerably higher” than $42,000 a year, a view that is again consistent with DOL’s proposed $933 per week threshold. The 1950 rule set the level 25 percent above the college entry-level wage; applying that same ratio today would yield a salary of about $1,000 a week. The Bureau of Labor Statistics publishes data of supervisory workers by occupation and median weekly earnings (U.S. BLS National Compensation Survey). For management occupations, the BLS breaks out four levels of supervisory responsibilities, and the median weekly earnings range from $1,520 to $3,995. Thus, by this metric, $933 is well below a level associated with supervisory, and presumably exempt, duties. Among all jobs in management listed by the BLS, only preschool education administrators and lodging managers earned a median hourly wage less than $23.33 per hour ($933 per week), and mean earnings for every management occupation were above that level. BLS grading of occupations by leveling factors (scores given to each occupation based on its demands for skills, knowledge, and responsibilities) reveals that an hourly wage of about $24 is consistently below level 7 (out of 15), consistent with nonsupervisory (nonexecutive) responsibilities. In light of these lessons, although Jared Bernstein and I recommended a higher level, DOL’s proposed $933 weekly salary level for exemption is clearly reasonable and within the historic range. Going forward, DOL has proposed to index the level to the 40th percentile salary or to adjust the 40th percentile salary in 2016, which is estimated to be $50,440, to inflation. Either method would be a crucial step in preserving overtime protections for middle-class working Americans, though as a matter of economics it makes more sense to peg the salary test to salary increases rather than to prices. Employees who don’t work overtime would not experience any adjustment in their hourly rate of pay. Employees who earn near the new threshold would likely receive salary increases to move them over the threshold, allowing the employer to continue allocating them the same number of work hours. Those workers, obviously, would be better off. Employees earning close to the minimum wage but currently exempt would either work fewer hours or receive time-and-a-half for their overtime. They, too, would obviously be better off. Many employees in the mid-range between the current threshold salary of $23,660 and the new threshold would have their hours reduced so the employer can avoid paying the OT premium: their overtime work would be given to hourly employees paid at a lower rate. They would be better off. Other mid-range employees might be converted to hourly and have their compensation reduced so that when they work the same overtime as previously, their compensation would be unchanged. Somewhere between 120,000 and 300,000 new hourly jobs would be created as the hours of the mid-range salaried employees were reduced. Goldman Sachs makes an estimate at the low end, but the National Retail Federation’s study, Rethinking Overtime Pay, predicts that about 110,000 jobs will be created in its sector of the economy alone. Retail and restaurant employment is less than 20 percent of all employment, so the economy-wide effects might be several times greater. Very little empirical research has been done on the effects of overtime regulation, but labor economists employ two basic models with quite different implications. The employment contract model posits that employers have a rough sense of how much they want to pay for a given worker, including any time-and-a-half overtime costs, and will adjust their “straight-time,” or base wage, offer down to a level that will make the total hourly wage, including OT costs, equal to their intended rate of pay. Under this model, wage offers adjust to hold labor costs constant. Assuming the employer’s estimate of the number of OT hours is roughly correct, the contract model predicts little change to labor costs or employment. An exception would be for workers with earnings near the minimum wage, since employers cannot adjust wages below the minimum. The other model simply assumes no adjustment (NA), maintaining that OT rules increase the marginal cost of an hour of labor by covered workers beyond what employers planned when they hired them. This would lead to a decline in their OT hours, as well as to an increase in hiring of additional workers to complete the necessary work without invoking the OT premium. In fact, one motive for enactment of the FLSA was that by increasing the relative cost of OT labor, employers would have an incentive to increase hiring rather than pay time-and-a-half. As we know, the FLSA worked, and the standard workweek did, in fact, become 40 hours. Anthony Barkume (2008) finds evidence for both effects, and estimates that employers will only partially offset the additional costs imposed by the rule on overtime labor. In correspondence with Jared Bernstein, Barkume reports that he supports overtime regulation and doubts that the employment contract model reflects reality because it wrongly assumes enough worker bargaining power to negotiate a real bargain. Workers at the low salaries affected by the NPRM do not have significant bargaining power. Lifting the salary threshold will cover millions of workers who are now exempt, so employers would have to lower their base wages to make the adjustments suggested by the contract model. That is much easier to do with new wage offers than with existing workers (nominal wages are rarely lowered), so it seems likely that the more standard NA would apply initially. Over time, base-wage adjustment dynamics could take hold if employers provide fewer and smaller raises than they would otherwise provide. A review of the history of OT regulations dating back to their inception in the FLSA of 1938 leads me to conclude that weak and inadequate duties tests—which are also often confusing and ambiguous—in tandem with salary thresholds that are too low have left far too many salaried workers uncovered by time-and-a-half protections. I support both raising the salary threshold to $50,440 in 2016 and adjusting for wage growth going forward. While many possible threshold levels could be defended and are undoubtedly legal, the proposed salary threshold is the minimum necessary to prevent abuse and effectively prevent the exemption of workers who are not bona fide executive, administrative, or professional employees. This change will extend overtime protection to at the very least 7 million—and almost certainly a much higher number—of workers who do not currently enjoy overtime protection, and will clarify and thereby strengthen protection for the remaining workers who earn below the proposed threshold and already enjoy overtime protection currently. In one way or another, all of the 15 million salaried workers who DOL identifies as earning more than the current salary threshold but less than the proposed salary threshold will benefit from the NPRM. More comprehensive reforms of the OT regulations would improve or repeal most of the 2004 changes in the duties tests, including by, for example, removing language that exempts team leaders, removing athletic trainers and licensed embalmers from the exempt professional occupations, and restoring the primary duty test to measure the duty an employee performs during most of her work time, while eliminating the notion that one can be an executive while performing menial duties. However, while we urge the Department of Labor to undertake such comprehensive reforms, we recognize that the reforms will be complex and time consuming. Raising and indexing the salary threshold is a simpler reform that can be accomplished in the very near term. The unattributed data and figures in this testimony are from an upcoming EPI report to be published in later July or early August 2015. Barkume, Anthony. 2008. “The Structure of Labor Costs with Overtime Work in US Jobs.” ILR Review, Vol. 64, No. 1. Kopczuk, Wojciech, Emmanuel Saez, and Jae Song. 2010. “Earnings Inequality and Mobility in the United States: Evidence from Social Security Data since 1937.” The Quarterly Journal of Economics, February. Linder, Mark. 2004. Time and a Half’s the American Way. Iowa City: Fanpihua Press. National Retail Federation. Rethinking Overtime Pay. Social Security Administration. Wage Statistics. Various years. Wage Statistics [database]. U.S. Department of Labor (DOL) Wage and Hour Division. 1940. “Executive, Administrative, Professional…Outside Salesman” Redefined, October 24. Washington, D.C.: United States Government Printing Office. U.S. Department of Labor (DOL) Wage and Hour and Public Contracts Divisions. 1949. Report and Recommendations on Proposed Revisions of Regulations, Part 541. U.S. Department of Labor (DOL) Wage and Hour Division. 1958. Proposed Revision of Regulations, Part 541, under the Fair Labor Standards Act, Report and Recommendations. March 3.